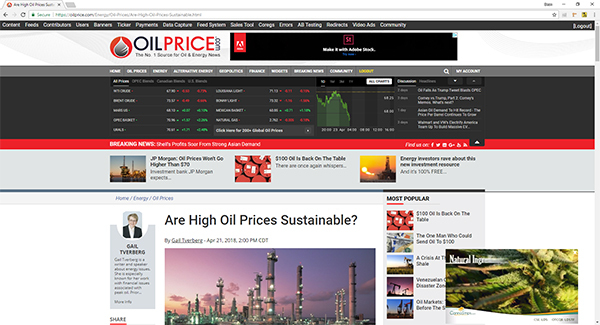 Our client OilPrice.com have been looking for a while for a video ad platform. They've spoken to a few companies and had trials - but the costs are often pretty huge. So we stepped in and made them their own - in just a few hours. The videos themselves are called from Vimeo.com so it requires a suitable Vimeo account but then our client doesn't have any additional hosting charges. When a new advertiser comes along, the OilPrice team can simply upload their video to Vimeo, then come back to their custom built CodeIgniter CMS and enter the URL to the video and how many impressions the video should have - that's how many times the video should show. They can also select a start and end date for the campaign which allows the ad platform to do the maths required to ensure the impressions are spread equally over the full term of the campaign. The guys can also select whether the ad appears in the body of the article, or whether it "sticks" to the bottom right of the screen - or both. And of course they can enter a URL for where clicking on the video should take the visitor. If a user wants rid of the video there's a clear X which closes the video and doesn't show it again for 30 days. It was put to use immediately, instantly giving OilPrice.com a great new revenue stream with instant ROI. If you think you'd like a neat little solution for selling video ads on your site, please get in touch.